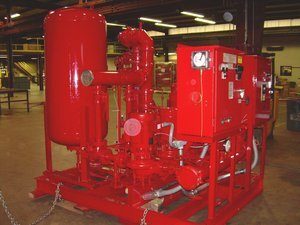 For projects that have a combined fire/domestic water supply, we offer prepackaged systems for those applications. The domestic water pumps, powered by UL Listed control panels, also serve as the fire system’s jockey/pressure maintenance pump. When demand on the fire system exceeds the normal pressure loss/fluctuations, the fire pump will engage. All piping on the system is suitable for domestic water use, therefore eliminating multiple building feeds as well as the “normal” jockey pump/controller arrangement.